The Rebel Sweetheart. : New Kitchen Cabinets with Style and Storage. New Kitchen Cabinets with Style and Storage. With the right kitchen cabinets, you can transform a plain, ordinary kitchen into a beautiful, luxury kitchen with unique, custom details. New kitchen cabinets can quickly change the look of your kitchen and give you updated style and well-organized storage. Your base and overhead cabinets need to be strong and functional. They need to be properly installed to make sure they don't become uneven or detach from the wall over time, so it's important to work with a reputable, licensed contractor for installation. 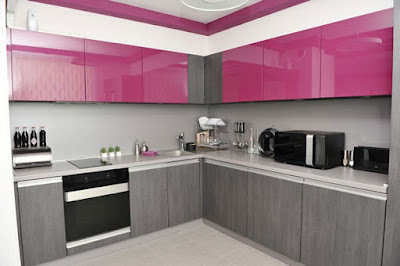 When choosing the layout for your kitchen cabinets, consider the location of your refrigerator, stove and sink. You want to create an easy path and reach from one to another to maximize function. When choosing base and overhead cabinets, locations, and sizes, make sure to consider your storage needs. Lower base cabinets should hold heavier items like small appliances, pots and pans, and cleaning supplies. Upper cabinets are better for lighter items like dishes, glassware and food items. There are wonderful cabinet accessories that will add extra storage and organization to your cabinets. You'll find everything from simple dividers to complex pull-out compartments that will keep your cabinets neat and well-organized. Today, kitchen cabinet doors and drawers are available in so many styles and finishes. Whether your home is traditional, modern or somewhere in-between, it will be easy to choose cabinets that compliment the style of your home. Cabinet doors and drawers are available in designs with flat, raised and recessed panels, flat, beveled and carved mouldings, and glass panels in clear, opaque, etched, and textured designs. When choosing a style, look for one that enhances your kitchen with an updated look and works well with the overall feeling of your home's interior design. If you want to give your kitchen a stylish, updated look and increase your kitchen storage, consider new kitchen cabinets with great custom features. To get started, get a contractor and quote now. Style Heroes | Dorothy Perkins AW2015.